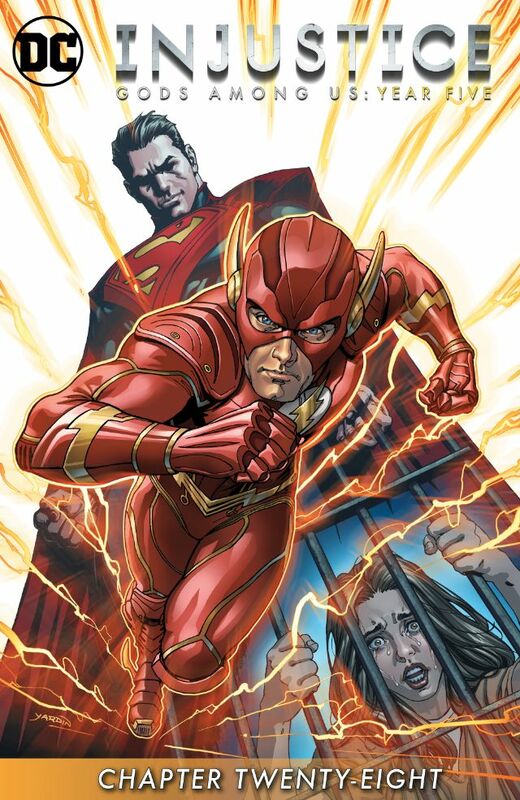 Flash tries to keep villains, working with Superman's Regime, from arresting dissenters, with Iris West being one of them. However, the insurgents don't wish Flash's help. Iris is dead set against it after the Flash kills King Shark in an effort to save her. Flash turns them over, and recommits himself to the Regime. Story - 1: Two characters, Flash and Captain Marvel, have wrestled, somewhat, with the actions of the Regime. They both remained for dubious reasons i.e. they have to remain with the Regime for the video game, and the story is poorer for it. Flash acts out of character and by returning to the Regime, winged-hat in hand, he's even more so. Barry's conscience has been nagging him since Year One (and the recap of events from Year One would have been a nice touch if presented accurately), but hasn't done anything with it till now. Flash saving Batman could have been a turning point, but he only saved him for use in the video game, much as he remains with the Regime for the same reasons. The worst of it is Barry killing King Shark. I doubt anyone else will care, but it's obvious that it wasn't necessary to kill King Shark to save Iris. Rather, it was a cheap and boilerplate move to put Flash on equal footing with Regime Superman. The story rings false, the execution is diaphanous, and the series is just hollow. Art - 4: No one does Regime Superman better than Tom Derenick. Look at the glower, the scowl, the sheer madness about his visage. Too bad there is no story to support it.